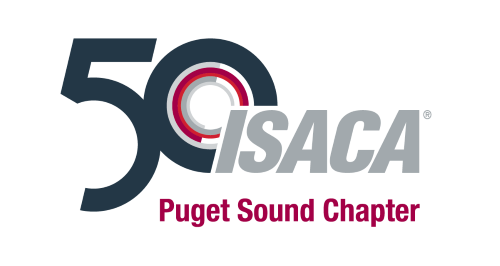 Welcome to the ISACA Puget Sound Chapter. The aim of the Chapter is to sponsor local educational seminars and workshops, conducts regular chapter meetings, and help to further promote and elevate the visibility of the IS audit, control and security profession throughout the area. ISACA (previously the Information Systems Audit and Control Association) is a worldwide association of IS governance professionals. The association currently focuses on assurance, security, and governance and provides globally recognised certification in assurance (Certified Information Systems Auditor), risk (Certified in Risk & Information Systems Control), security (Certified Information Security Manager), governance (Certified in the Governance of Enterprise IT), and cybersecurity (Cybersecurity Audit (new), CSX Practitioner, Cybersecurity Fundamentals). The association is one of individual members who are practitioners of information systems auditing, security, risk, and/or governance in his or her organization. The membership of the ISACA reflects a multiplicity of backgrounds and skills that make our profession challenging and dynamic. This chapter is run by volunteers who are ISACA members nominated and elected through an established process. Please contact us if you are interested in serving on the board.